I absolutely ADORE S’mores. After seeing some fun S’mores Puppy Chow on my good friend Sally’s blog, Sally’s Baking Addiction, I knew I wanted to try some for myself but change it up slightly. This. Stuff. Is. AMAZING! I made this for a roomie reunion and it was gone SO fast! If you love s’mores, snack food or anything delicious… then make this recipe! It has Nutella in it which makes this recipe even more addictive than usual. You will LOVE it! This stuff is delicious and dangerously addictive! I seriously can't get enough of it! In a large bowl, measure out Golden Graham cereal. Set aside. In a medium microwave safe bowl, melt chocolate candy coating, in 30 second intervals, until smooth. Stir at each interval. Once completely melted, stir in Nutella and marshmallow creme/fluff until smooth and completely combined. It will be THICK! Pour evenly over cereal, stirring to evenly coat. Be patient, because it is thick it make take some time, but it will coat the more you work with it. Next, stir in marshmallow bits and chocolate chips. LOVE this recipe Nikki. The s'mores version is my favorite puppy chow. I can't even believe how addicting it is. Wonderful job my good friend! Words cannot explain how much I want these. Summer is coming. So perfect. what are chocolate candy coating ? It can be found in the baking aisle next to the chocolate chips. It is just chocolate you break up into blocks and melt. Hmmm yum! Puppy chow is one of the most addictive things I've ever eaten. Something about chocolate covered finger food. I can't keep my hands out of it and I bet the same thing would happen with this recipe! Where do you find the marshmallow pieces? Oh I gotta try this one! This looks to die for! If we can't use Nutella due to a nut allergy, would I just sub in an extra 1/2 c. of melted chocolate? Thanks! 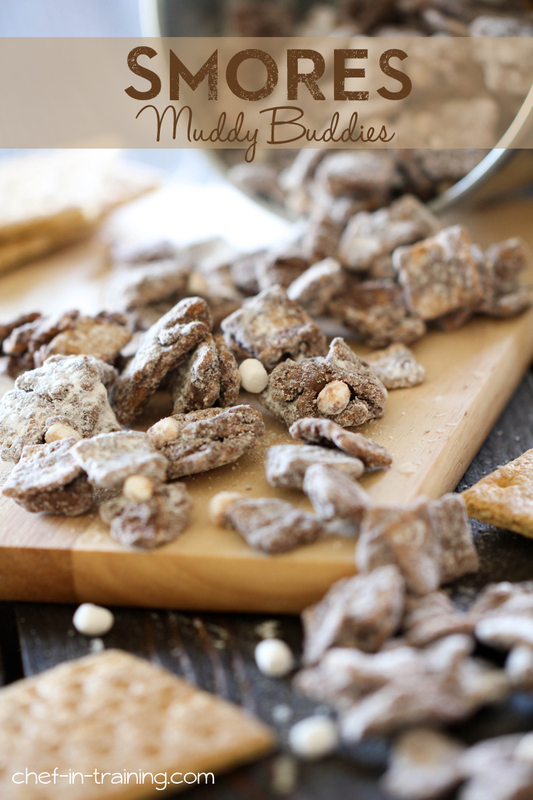 I love all the fun flavors of muddy buddies that have been popping up all over. Especially enjoy that these use Nutella too! Looking for the S'mores Muddy Buddies recipe on this link. There is an introduction paragraph, image, and no recipe.